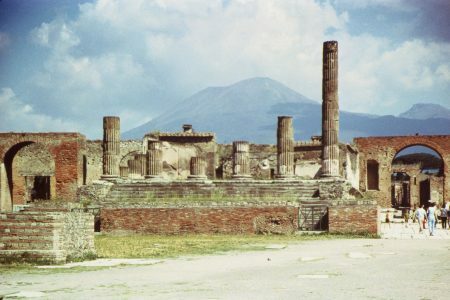 The temple of Jupiter, at the end of the Forum nearest Vesuvius, was probably the most prominent site of worship in Pompeii at one time. The goddesses Juno and Minerva were also worshiped at this temple. The triumphal arch to the left side of the Temple of Jupiter was dedicated to the Roman Emperor Tiberius, who ruled from 14 to 37 A.D., which was during the earthly ministry and crucifixion of Jesus Christ. The arch to the right side of the temple above was for Emperor Nero, who ruled from 54 to 68 A.D. The arches would have been covered in marble veneer.